Max Porter’s prize-winning, bestselling debut novel is brought vividly to life by Enda Walsh’s visionary adaptation of a portrait of a man’s struggle with grief in the aftermath of his wife’s sudden death. When Dad (Cillian Murphy, Inception and Peaky Blinders) loses his wife in a sudden tragic accident, he has an encounter with grief. Grief appears to him as a Crow; a huge, monstrous, overbearing entity that comes into his home and lives with him and his sons and changing their lives forever. Poetry is central to Porter’s book. The title is a misquotation from an Emily Dickinson poem, “Hope” is the Thing with Feathers, and the central antagonist, Crow, is inspired directly by a major work by the poet Ted Hughes. This all fits because, in Porter’s story, Dad is a scholar of Hughes’ work, trying to write an analytical book upon it in the aftermath of the family’s tragedy. In adapting Porter’s book for stage, Walsh has managed to achieve the ultimate of adding much while taking nothing away. Porter’s original text, which is written as a series of monologues with occasional dialogue, is essentially a ready-made script. But Walsh, in his characteristic way, has brought it to life with vigour, using a battery of visual and auditory effects to ensnare and portray the monstrosity that is grief. This is the fourth collaboration between director Walsh and actor Murphy, and the third to have hit a London stage in recent years. Each has been superb and this is no exception; the pair are quickly becoming a dream team of contemporary theatre. Two of Walsh’s originals, Misterman and Ballyturk (with Murphy in lead roles), enjoyed acclaim at the National Theatre in 2012 and 2014 respectively. He’s a director with a distinctive style; his sets, typically static interior scenes, chillingly juxtapose the claustrophobic feel of being trapped in a single room, and the agoraphobia of that room being apocalyptically vast, even endless. As his actors fret about – always energetically, nervously – they sink deeper into the metaphorical quicksand of their surroundings, and their own psyches. Walsh also deploys technology in his productions as a leit motif; pre-recorded audio segments, a core component of Misterman, play a prominent role in Grief is the Thing with Feathers, as do projections on the vast apartment wall, frenetic strobe effects, and the heavy vocal distortion used to give Murphy the deep, dark, frightening voice of Crow. Murphy, meanwhile, is superb. (He always is.) The versatile Irishman is captivatingly chameleonic; as Dad, he is the quiet, grief-stricken everyman – a picture of imperfect inadequacy and worried uncertainty with a poorly thought-out moustache. He is heart-warmingly, and heart-breakingly, relatable. As Crow, he is a bundle of uncontrollable energy, twitching, hopping, jumping, springing up and down on his haunches, leaping about causing absolute mayhem. A nightmare figure, Crow is cruel, merciless, unstoppably present. And yet he is something Dad and the boys can come to live with, make peace with, even find solace in. To say more about what transpires would be to spoil the truncated plot of this remarkable drama. Simply put: Grief is the Thing with Feathers is profoundly honest, at times terrifying, and utterly brilliant from start to finish. Go and see it. 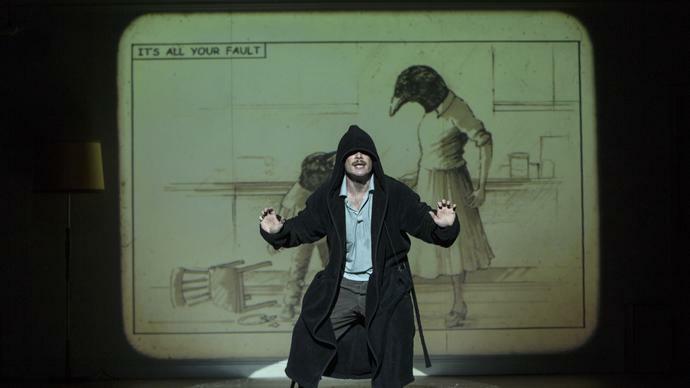 Grief is the Thing With Feathers is on at the Barbican until 13th April. For tickets visit their website.